On Saturday the Iowa Democratic Party Central Committee addressed the complaint national media and other states have had about an opaqueness of our first in the nation precinct caucuses. It looks like the state party will release raw support tallies (i.e. not votes) for the first time since Iowa rose to prominence in the wake of the disastrous 1968 Democratic National Convention in Chicago. The Chicago convention brought us Hubert H. Humphrey of Minnesota, the last nominee to emerge from a smoke-filled room. My friend from the 2007-2008 John Edwards campaign David Redlawsk wrote the book (with others) on the Iowa Caucuses, Why Iowa? People don’t always buy the authors’ answers. I land with my friend and fellow Democrat John Deeth who settled for 10 percent and accepted the IDP changes. As an Iowan more active than most in Democratic politics, I acknowledge the decreasing significance of what we do in the presidential horse race. While we get to see a number of presidential hopefuls, and garner media attention in the run up to caucus night, the early presidential nominating process includes not only the four early states — Iowa, New Hampshire, South Carolina and Nevada — but Super Tuesday (this time on March 3, 2020) when a number of states and U.S. territories hold their presidential primaries. The idea that Iowa would winnow the field of presidential hopefuls is less true than it was because of this. Clearly there are more than two or three tickets out of Iowa this cycle as smart candidates are already campaigning in California, Texas, and other Super Tuesday states. If viable, they will continue at least that far. It is an easy prediction that the nomination will be winnowed down to two after Super Tuesday, and this year, maybe even to The One. It’s also true that winning Iowa alone is not enough. John Edwards put almost all the chips on the table to win Iowa and when he came in second in delegate count, he had to scramble to cover South Carolina and Nevada with organizers. Whatever the tallies in the four early states, whatever number spinning takes place, a rationale for continuing has to be credible even with new momentum toward Super Tuesday. I don’t know if any of them will be my final choice on caucus night. The Democratic National Committee did the first funnel for us already by requiring participants in the first summer debate to secure at least 65,000 unique donors of any dollar amount. Some may grumble about money in politics or “insiders” controlling who’s viable and not, however, number of donations is a fair and transparent measure of viability. 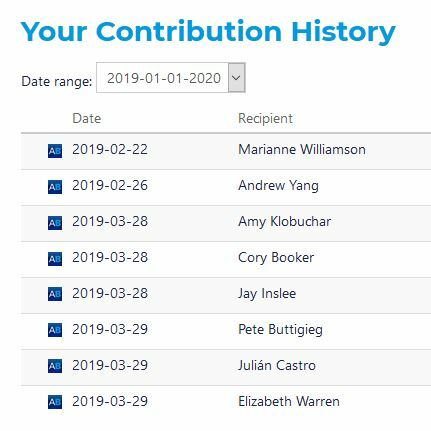 I gave small donations to eight candidates I’d like to see on the debate stage. I don’t know if any of them will be my final choice on caucus night. The 2008 caucus, the closest to level of participation we might see in 2020, was a nightmare from my perspective. The room wasn’t big enough and I chose to both be a precinct captain for John Edwards and help my friend Bob run the event. Doing both proved to be impossible. We had only about 260 attendees. We put the Edwards group in the hallway, partly because we had so many infirm and elderly in wheel chairs, but also because there wasn’t enough room in the main room to count. I had to count attendees multiple times, which got everyone mad at me, with accusations that my true purpose was to recruit more people for the Edwards camp. In the end, after the final alignment, Obama had 85 people, and Clinton and Edwards split the rest equally, requiring a coin toss to see who got an extra delegate. (Hillary won the coin toss). Once delegate assignments to the county convention were finished, the mass exodus left Bob and me struggling to fill our precinct’s allocated committee positions. The Iowa caucuses in presidential years are not as much about organizing the party. There is a legitimate issue with finding enough rooms to adequately accommodate caucus-goers, so it would be great if people caucused virtually instead of showing up to name their candidate, then go home without further ado. To say the actual caucus helps organize the party is inaccurate, it doesn’t. If there wasn’t a shortage of people interested in training to run a caucus, I’d participate virtually and let go the reins. Iowa retained first in the nation status this year partly because IDP was forced to listen and make the caucuses more inclusive and transparent. Having done that, we have an avalanche of presidential hopefuls arriving in the state. My main goal is to keep focus on what I believe is the prize (the contest for U.S. Senator) and avoid getting trampled by the donkey stampede. In my favor is experience, which will hopefully prevent me from picking unnecessary fights.